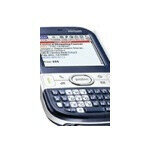 Palm and Verizon Wireless are jointly offering a $25 gift card for those who purchase Palm Centro smartphones. 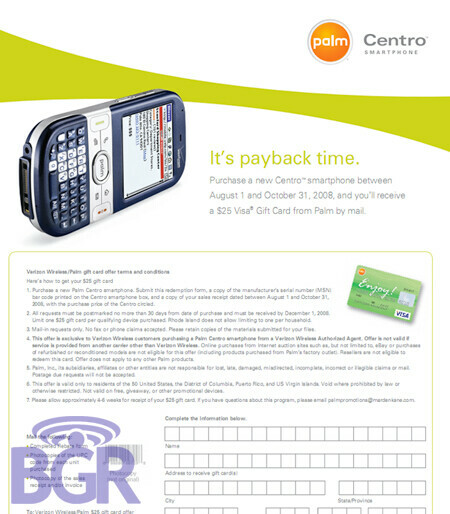 Though the offer is only for indirect stores at the moment, and requires that you wait six weeks (much like a rebate) before you see the $25 Visa gift card, the offer is still good, particularly for those that are interested in the Centro or are relishing the old Palm interface. The offer expires on October 31st. Have you ever used the Centro? This phone is fantastic! For only $100, and you get a $25 gift card. Way better than the voyager or the dare as you can actually DO STUFF on this device. Grant it is Palm's 12 year-old sw, but that aside. The centro is totally worth the money. Looks like your PEEPS are working so good now!